Thanksgiving is this week, and if you’re like me, you’re busy preparing for the big holiday with family. It’s a time to be thankful for our many blessings in life and to show our appreciation for one another. This week, I’m thankful for the growing community on this blog. It’s thanks to your loyal readership and thoughtful comments that make this blog so great! The book is the first of a five-part Montana Family Ranching Series: a photographic story-telling project of the Montana Stockgrowers Association (MSCGA) says. 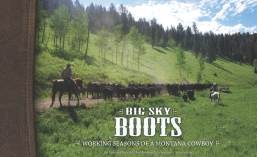 In “Big Sky Boots,” readers can journey through the ranching year and learn about the great people who take care of the land, livestock and their families. This first book focuses on the cowboys themselves; the men and the seasons. Photography and impressions by Lauren Chase. A $75 value, this newly released book would make the perfect Christmas gift. You can enter to win one with this week’s contest, or order one — or a dozen — here. To enter to win, simply leave a caption for this photo, also by Lauren Chase, in the comments section below. Entries will be accepted until noon on Nov. 21, and the winner will be announced on Thanksgiving Day. Good luck!